When he began working his way through the presidency literature to prepare to teach, however, he was struck by just how little these scholarly works had in common with his own experiences under Truman. They described the presidency in terms of its formal powers, as laid out in the Constitution and subsequent statute, or as an amalgamation of different roles – chief diplomat, chief legislator, etc. To Neustadt, these formal powers and related roles – while not inconsequential – told only part of the story. To fully understand what made presidents more or less effective, one had to dig deeper to uncover the sources of the president’s power. With this motivation, he sat down to write Presidential Power, which was first published in 1960 and went on to become the best selling scholarly study of the presidency ever written. Now in its 4th edition, it continues to be assigned in college classrooms around the world (the Portuguese language edition came out three years ago). Neustadt’s argument in Presidential Power is distinctive and I certainly can’t do justice to it here. But his essential point is that because presidents share power with other actors in the American political system, they can rarely get things done through command or unilateral action. Instead, they need to persuade others that what the President wants done is what they should want done as well, but for their own political and personal interests. At the most fundamental level that means presidents must bargain. The most effective presidents, then, are those who understand the sources of their bargaining power, and take steps to nurture those sources. 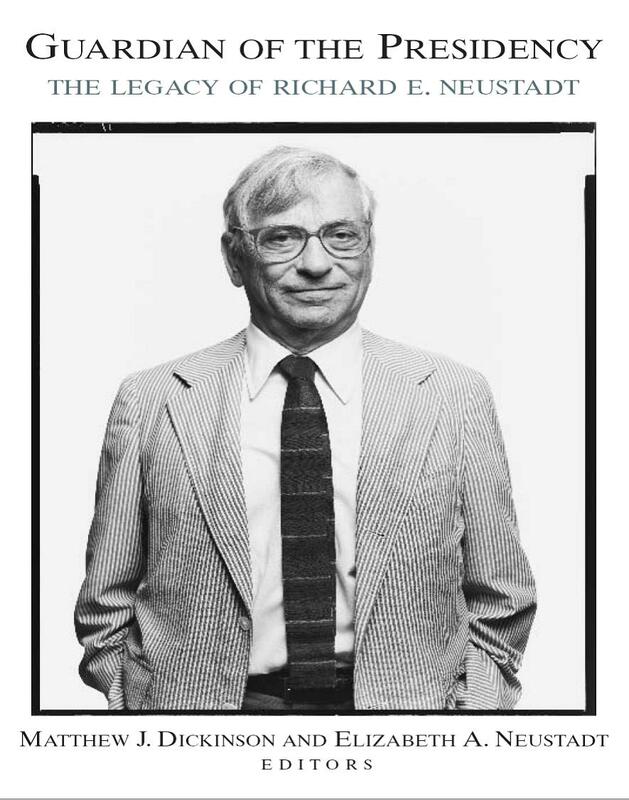 After publishing his classic work, Neustadt was subsequently asked to join Kennedy’s White House staff but – with two growing children whom had already endured his absences in his previous White House stint – he opted instead to stay in academia. He went on to help establish Harvard’s Kennedy School of Government, wrote several more award-winning books, and continued to advise formally or informally every president through Clinton. (Many of his presidential memos were later published in this book.) After the death of Bert, his first wife, he married Shirley Williams, one of the founders of Britain’s Social Democrats Party (and now a Baroness in the House of Lords), which provided still another perspective on executive politics. He also continued churning out graduate students (I was the last doctoral student whose dissertation committee Neustadt chaired at Harvard.). When I went back to Harvard in 1993 as an assistant professor, my education continued; I lured Neustadt out of semi-retirement to co-teach a graduate seminar on the presidency – an experience that deepened my understanding of the office and taught me to appreciate good scotch. It was the last course Neustadt taught in Harvard’s Government Department, but he remained active in public life even after retiring from teaching. Shortly before his death he traveled to Brazil to advise that country’s newly-elected president Lula da Silva. When he began working his way through the presidency literature to prepare to teach, however, he was struck by just how little these scholarly works had in common with his own experiences under Truman. They described the presidency in terms of its formal powers, as laid out in the Constitution and subsequent statute. To Neustadt, these formal powers – while not inconsequential – told only part of the story. To fully understand what made presidents more or less effective, one had to dig deeper to uncover the sources of the president’s power. With this motivation, he set down to write Presidential Power, which was first published in 1960 and went on to become the best selling scholarly study of the presidency ever written. Now in its 4rth edition, it continues to be assigned in college classrooms around the world (the Portuguese language edition came out two years ago). Neustadt’s argument in Presidential Power is distinctive and I certainly can’t do justice to it here. But his essential point is that because presidents share power with other actors in the American political system, they can rarely get things done through command or unilateral action. Instead, they need to persuade others that what the President wants done is what they should want done as well, but for their own political and personal interests. At the most fundamental level that means presidents must bargain. The most effective presidents, then, are those who understand the sources of their bargaining power, and take steps to nurture those sources.